Semana Santa or Easter is a very special time on the Camino. The heart, mind, body and spirit of all is open, flowing, and sharing in truly wonderful WAYS. Inspiration, connecting, and giving with others is a unique part of springtime just like the trees bringing their new fresh green leaves and flowers blooming their vibrant colors in all different shades like the rainbow and so is the camino spirit this holiday week. 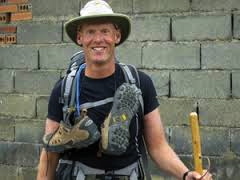 Kurt Koontz author of A MILLION STEPS would like to share a little Camino inspiration with all who would enjoy receiving a true gift of the heart – a free kindle download of his book. It has been my pleasure to receive this special gift and I hope you to will be as touched as I have been in reading this fantastic book of his camino journey. Muchisimas Gracias Kurt! This entry was posted in Acts Of Giving & Sharing and tagged A Million Steps - Kurt Koontz, Books About The Camino De Santiago De Compostela, camino, Camino de Santiago de Compostela, Camino Gratitude, Camino Stories, charitable acts of kindness, culture, Inspiration, nature, outdoors, Santiago de Compostela, The Way, The Way of St James, traditions, Travel. Bookmark the permalink. I am so honored to be our friend!